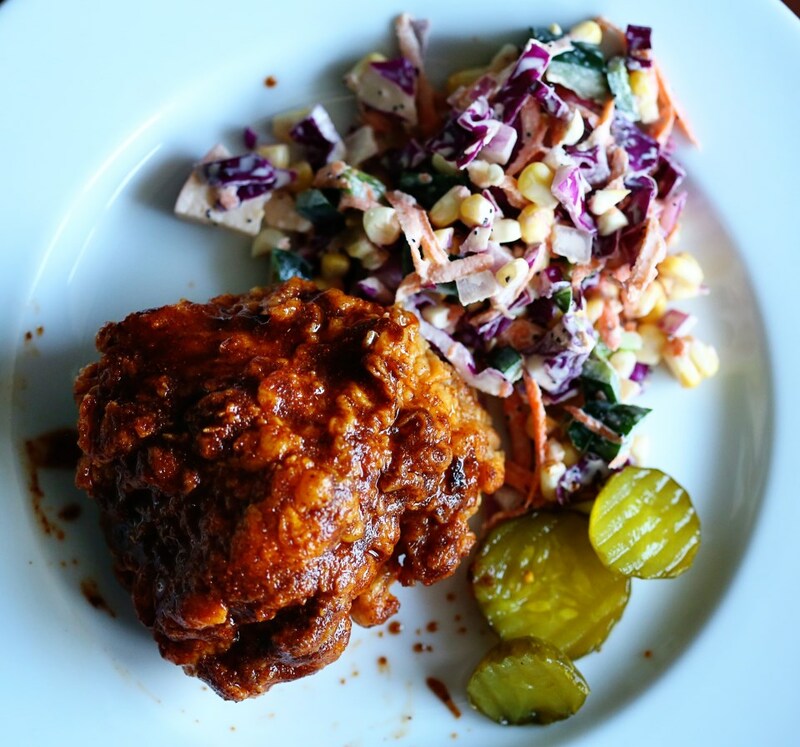 When we went to Nashville to visit my family this summer I knew I had to try some hot chicken. I asked my brother and my cousin if they had been to Prince’s, and both replied that they would like to, but hadn’t found anyone willing to visit that part of town with them. Problem solved. We took my grandparents’ Buick to a little strip mall in east Nashville, and after a quick trip to the ATM (Prince’s is cash only) we ordered a bunch of chicken in heat levels ranging from mild to extra hot. We waited for our order for something close to an hour, with the kitchen constantly calling out orders. The room was always crowded, even on a weeknight, but I think I only saw one table where people were eating – everyone seems to order carry out. You can call ahead, but I got nothing but a busy signal whenever I tried. When we got home everyone dug in. The chicken isn’t saucy like Buffalo chicken, the heat comes from a mix of oil and spices (notably cayenne) that is brushed on the chicken after frying. The bread each piece was packed with had soaked up the excess oil, making the chicken a relatively clean meal. Bread is a good idea too – or potato salad, or anything else you can find to tame the heat! I love it when I get something with just the right amount of heat – it builds until it seems too much, but a couple of minutes later I’m reaching for another piece. The crust on Prince’s chicken is super crunchy despite the oil, the chicken was juicy, and the spice is great – garlicky with a hint of sweetness. The “hot” chicken was about perfect for me, but even the medium is respectably hot. The mild was tame enough that my notoriously heat-averse grandfather enjoyed it. The extra hot? Too much for me. I know a couple of people that would probably enjoy it, but I couldn’t handle more than a couple of bites. I loved making hot chicken at home. The oil and spice mix is a great technique – we made some cayenne-free pieces for Olive and the flavor of the brown sugar and garlic stands out so much more when brushed on after frying than it does when the spice is in the flour. 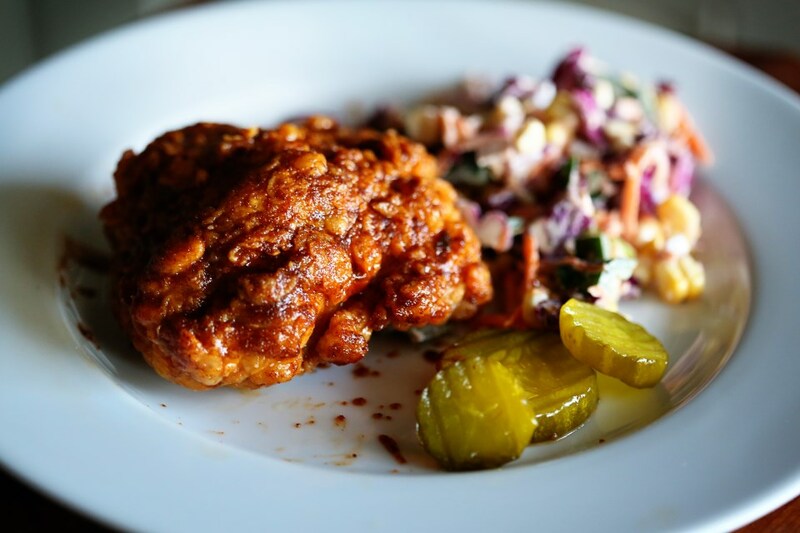 Even if you aren’t making hot chicken, this trick is worth stealing. I encourage you though to be brave and mix entire tablespoons of cayenne into the oil – when do you ever get to put even a single tablespoon of cayenne in anything?. Get a jar of pickles, a side of potato salad, a stack of soft white bread, and find that sweet spot. Seen here with a side of corn slaw and sweet pickles. Perfect! Toss chicken with black pepper and 2 TBS salt in a large bowl. Cover and chill for at least 3 hours. Whisk eggs, buttermilk and hot sauce in a large bowl. Whisk flour and remaining 4 tsp salt in another large bowl. Fit a Dutch oven with a thermometer; pour in oil to measure 2 inches up the side. Heat over medium-high heat until thermometer registers 325F. Pat chicken dry. Working with 1 piece at a time, dredge in flour mixture, shaking off excess, then dip in buttermilk mixture, letting excess drip back into bowl. Dredge again in flour mixture and place on a baking sheet. Working in 4 batches and returning oil to 325F between batches, fry chicken, turning occasionally, until skin is deep golden borwn and crisp and an instant-read thermometer inserted into the thickest part registers 160F for white meat and 165 for dark, 15-18 minutes. Transfer to a clean wire rack set inside a baking sheet. Let oil cool slightly. Whisk cayenne, brown sugar, chili powder, garlic powder and paprika in a medium bowl; carefully whisk in 1 cup frying oil. Brush fried chicken with spicy oil. Serve with bread and pickles.